Of course, I don’t completely agree. Yes, keep your BTC savings in your own wallet, preferably offline. 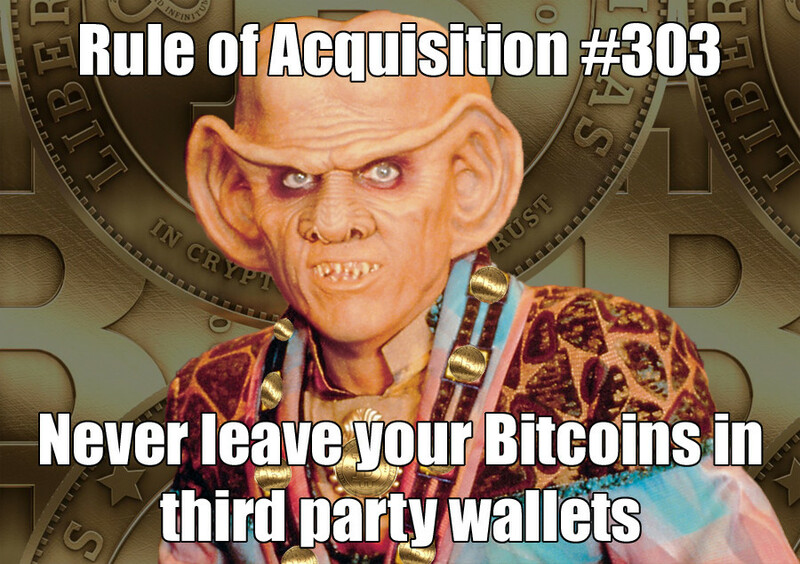 But… you will need third party wallets for trading, for now at least. Maybe with multi-signature transactions, you could trade between persons directly, with the exchange as the signing middle-man, keeping account. That would be interesting! People ask me what they could do with bitcoins if they had some. I could come up with serious purposes, like buying stuff online. Tonight I found the betting website Bets of Bitcoin, where you can bet on statements that people made, or post your own. I like the clean design and the clear concept: either you agree to a bet or you don’t. The minimal bet of BTC 0.1 is a bit disappointing. Wouldn’t it be fun to be right on something for the price of BTC 0.005 and win 0.012, for example? My bet is Agree for BTC 0.5. Challenge me! Just ran into an excellent collection of links to statistics on Bitcoin accompanied by a short description. A good starting point for the intermediate bitcoiner. Video: Wat is Bitcoin? Met ondertiteling. Een uitstekende introductie tot het Bitcoin betaalsysteem. Prachtig geillustreerd.